15,000 SQFT Coverage, 28-0-3, Zero P Turf Builder, Weed & Feed, With New Weed Grip Technology, Phosphorous Free, Kills Dandelions & Feeds Grass To Crowd Out Future Weeds, Builds Thick, Green Turf From The Roots Up Without Burning Your Lawn, Apply When Weeds Are Actively Growing, But No More Than 2 Times Per Year, Do Not Use On St. Augustinegrass, Floratam, Dichondra, Lippia, Carpetgrass Or Bentgrass Lawns. Fall is the best time to feed with Scotts® Turf Builder® WinterGuard® Fall Lawn Food. It builds strong, deep roots for a better lawn next spring. The lawn food is formulated to deliver the nutrients lawns need in the fall to repair damage from the heat, drought and activity of the summer, ensuring stronger grass in the spring. 5,000 sq ft coverage, 20-27-5, premium new lawn starter fertilizer. Formulated with high phosphorous to encourage new grass to develop a strong root system, provides controlled release nitrogen for entended feeding, polymer bag. Scotts, 5,000 SQFT Coverage, 30-0-4, Super Turf Builder With Summer Guard, Apply In Summer, June Through August, For Strong Control Of Lawn Insects, More Greening Power Then Turf Builder With Bifentrhin For Lawn Insect Control. • Controls Moss While Helping Develop A Thick, Green Lawn. • Apply Anytime Moss Is Present And Actively Growing. • For Use On All Lawns And Grass Types. Apply anytime moss is present and actively growing. For use on all lawns and grass types. Apply when the lawn is moist. Kills moss and helps develop a thick, green lawn to discourage moss from returning. Do not use on newly seeded lawns until after the fourth mowing. • Feeds and strengthens against heat and drought. • Kills and protects against listed bugs. • Won't burn lawn, guaranteed! Listed insects: ants, armyworms, billbugs, chiggers, chinch bugs, crickets, fleas, grasshoppers, mole crickets, mealy bugs, sod webworms (lawn moth larvae), spiders, ticks, weevils. • Improves seeding results! Also great for sod and grass plugs. Scotts Turf Builder Lawn Food 5,000 sq. ft.
Scotts® Turf Builder™ Lawn Food helps you to build a thick, green lawn. It's formulated with Scotts' exclusive All-In-One Particles to provide an even greening and feeding. Using Scotts Turf Builder Lawn Food thickens your grass to crowd out new weeds and strengthens your lawn to help protect it against future problems. • Feeds and greens for fast green up after winter. • Improves lawn's ability to absorb water and nutrients. 5,000 sq ft coverage, 30-0-4, Turf builder halts crabgrass preventer with lawn food, prevents crabgrass all season, feeds & greens for fast greenup after winter, improves lawn's ability to absorb water & nutrients, apply in early spring. • Kills moss, not lawns. Guaranteed! 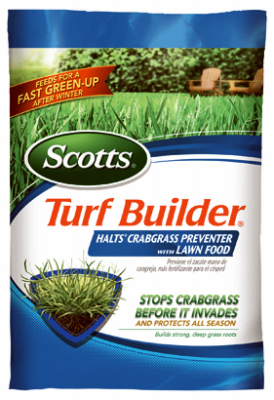 Scotts® Turf Builder® with Moss Control, kills moss and feeds to help prevent future problems. G&B Organics Lawn 8-1-1 Fertilizer 18 lbs. •	Ideal for all warm-season or cool grasses and new lawns from seed, sod or sprigs. G&B ORGANICS LAWN FERTILIZER is perfect for creating a thicker, greener lawn. It’s made from natural ingredients that feed the soil and dissolves quickly after a thorough watering, and because it is organic, there is no fear of burning your lawn. It also helps reduce thatch, develop a deep root system, and add important nutrients to your lawn. Spread or hand-toss granulated G&B ORGANICS LAWN FERTILIZER on an established lawn to give it a boost of nutrition, or add it when laying down sod. Because it’s natural and organic, with no harmful synthetic chemicals, it can be applied on grassy areas where children and pets play. This 15-5-10-16 with trace minerals formulation can be used as an all-purpose lawn food year around. The application rate is 6-8 lb per 1,000 sq ft, and application fre¬quency is every four (4) weeks. Water in thoroughly at time of application. Keep your lawn in top condition with regular applications of Rogue Lawn Fertilizers throughout the year. All Season Controlled Release Lawn Food + Iron Fertilizer | This 23-3-13-4(S) Formulation fertilizer contains non-staining Iron and is formulated for all seasons. The Application Rate is 5 lbs per 1,000 square feet and application frequency is every eight (8) weeks. Water in thoroughly at times of application. Great fertilizer. Rogue Fertilizer Sulfate of Ammonia 21-0-0-24 formula should be used to get rapid greening and top growth on a lawn. Application Rate is 5 lbs. per 1,000 square feet and application frequency is every (4) weeks. Water in thoroughly at time of application.